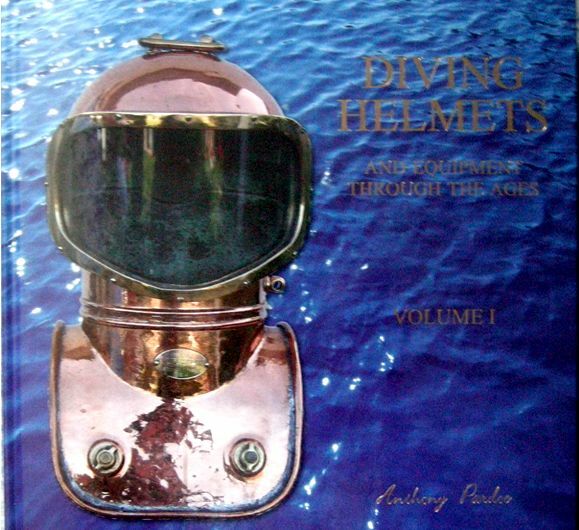 Some months ago, a new collection diver’s book arrived on the scene, titled DIVING HELMETS AND EQUIPMENT THROUGH THE AGES. 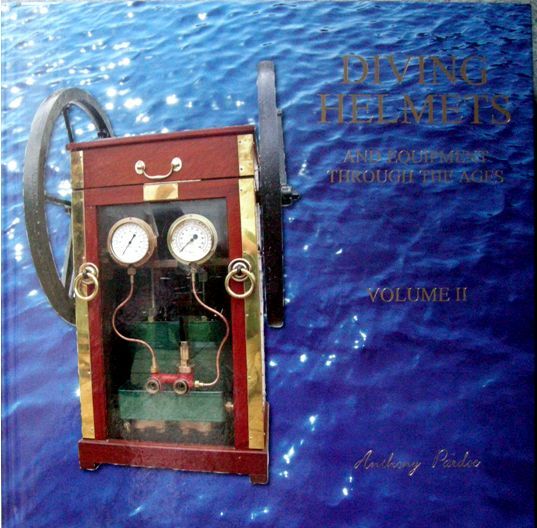 In two volumes, master diver Anthony Pardoe, having one of the largest collections of historical diving gear, describes and shows in hundreds of excellent color pictures, many in detail, from his collection of diving helmets and equipment, all that a diver would need for going below to work. Anthony and his wife Yvonne have worked on this project for over six years with support of various well known specialists on this subject and supply the reader with an extensive lot of information. Both volumes are hardback and are inserted in a nice hardbound sleeve for extra protection, each book’s measurements being 285 x 285 x ca 25 mm and the total weight is 4,7 kg. 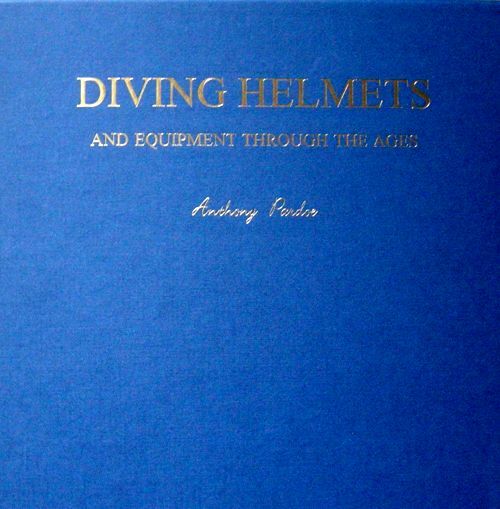 The first book is concentrating on the helmets in his collection, 245 pages, and the second book contains all the necessary accessories needed for a working diver, many in different forms and shapes, 225 pages. A must have for the collector’s library. “Great book, wonderful photography: an interesting look into one’s collection and viewing the many fine accessories associated with hard hat divers and their work. Well done, Tony and Yvonne”. According to an agreement with Tony Pardoe, NAUTIEK will do the distribution. The price is fixed on GB£ 299 / € 370 / US$ 485, excl. 6% V.A.T. and excl. costs of shipping off The Netherlands. At the end of 2010 Dr Stracimir and his son Dr Gojko Gosovic published their in English translated book COMMERCIAL AND NAVAL DEEP DIVING MANUAL, in which the fundamentals of Deep Diving Technique and Medicine are described. The content of the book directs itself on modern deep diving with a Deep Diving System (DDS) at a depth of over 50 meter (165 feet). During deep diving, divers utilize two-or three-component oxygen depleted gas mixtures. In relation to depth, diving between 60 and 200 meter is considered as a standard deep dive; dives over 200 meter are categorized as dives at exceptional depth. Deep diving can be divided into short-term (bounce) diving and saturation diving. 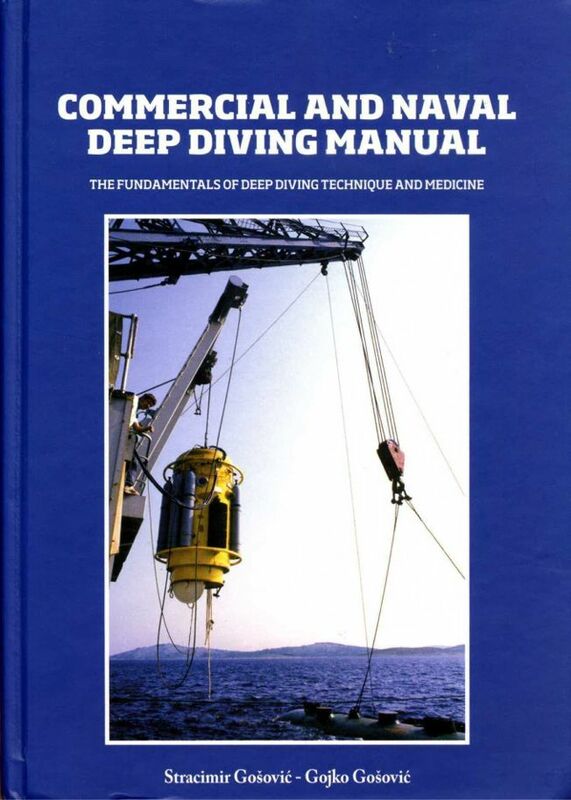 The hardbound book contains 485 pages (dimensions 25 x 18 cm / 10””x 7,5”) and describes on a very comprehensive way the techniques, the operational and medical aspects of modern deep diving and is provided with many drawings, pictures tables and schemes. The book is comprised of three parts. The first deals with the general principals of contemporary deep diving, related to both bounce- as well as deep diving. The second part systematically examines the technique and technology of bounce diving; the third part is dedicated to saturation diving. The intention of the authors is to bring deep diving closer to its readership, primarily to the present and future generation of deep divers. In their approach, the authors placed key emphasis on the acquisition of general and specific knowledge in the fields of medicine, deep diving techniques, the application of safety measures, the provision of specific and general medical aid and the mandatory application of diving discipline, without which safe and efficient diving is impossible. The attitudes, expressed in this book are based on concrete research and recommendations issued by authorized national and international institutions, like the US Navy, the Russian Federation Navy, the International Marine Contractors Association (IMCA) and the Diving Medical Advisory Committee (DMAC). References to and quotes of relevant IMCA publications form an integrated part of the extensive information in this book. The price is Euro 82,50, excl. V.A.T.., -packing and -postage by mail. Professor Stracimir Gosovic, Md, PhD (born on December 25th 1927), is the founder and was for many years the director of the Department for Underwater and Hyperbaric Medicine of the Navy Medical Institute in Split, Croatia. He was founder of contemporary underwater and hyperbaric medicine on the area of ex Yugoslavia. He started with hyperbaric medicine as a scientific and medico-clinical discipline in 1969 and with contemporary deep diving activities, including open sea saturation diving in 1977. In the time between, modern navies before the Yugoslav Navy accepted saturation diving technology that was until then practised only by the US Navy and the Marine Nationale Francaise. Gosovic also organized the modern Submarine Rescue Service and Training Centre in Divulje (Split). English – translated book “Commercial and Naval Deep Diving Manual”.